Who’s up for a School Days Jacket sew-along? I hope you will join us in a few weeks when we will be hosting one. We have four talented ladies who will be helping out. Janice, Deb, Sharon, and Amanda are each going to take a day of the sew-along. With this sew-along there’s something for everyone as there are quite a few options. 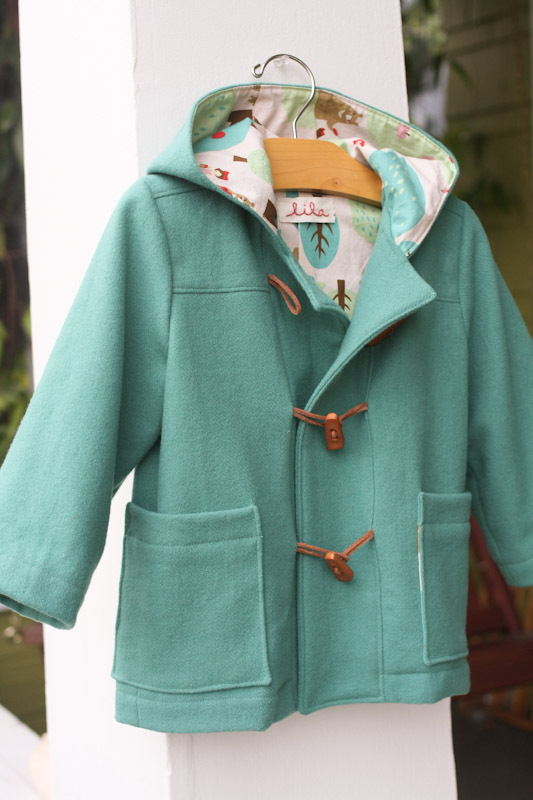 Sew a raincoat or a winter jacket. Sew for a boy or a girl. Sew one in sizes 6M-8. Girl’s or boy’s jacket or coat. Hooded jacket or coat includes full lining, patch pockets, snap or Velcro closure, and two choices of duffle closure details. 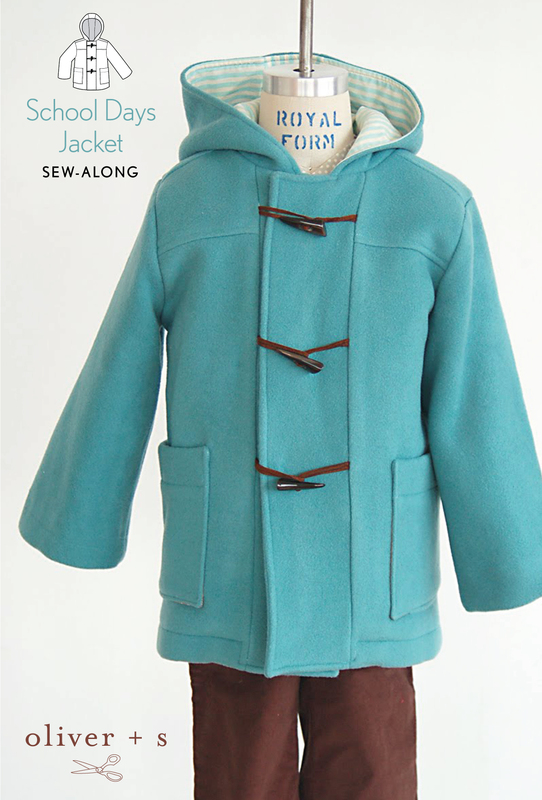 Optional removable quilted lining can be made with or without sleeves for additional warmth, and features buttons and elastic loops for attaching the lining to the jacket, as well as bias binding at the edges. Here is some inspiration to give you ideas of what you can make. Feel free to grab this optional button for your blog to show your participation. Gather your pattern, fabric, and supplies and we will see you here on Monday November 3rd! We can’t wait to see what you create! 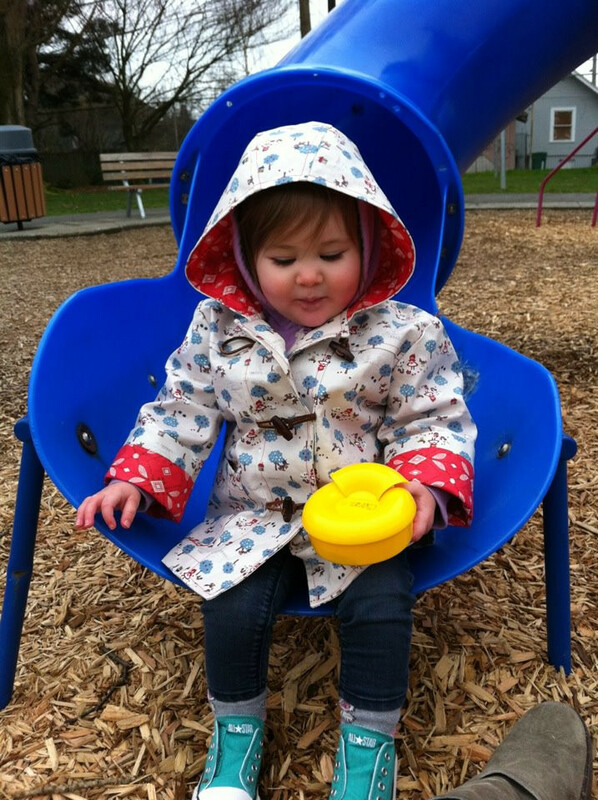 Be sure to add your completed School Days Jacket to the Oliver + S Patterns Flickr group. I’m excited! I love the school days jacket and have sewn it several times. I would LOVE to see a tutorial for adding a zipper included in this sewalong. Please, please? (Seriously, I am excited about the sewalong but I NEED advice on fabric selection. I always avoid sewing coats because I am terrified of getting it wrong). 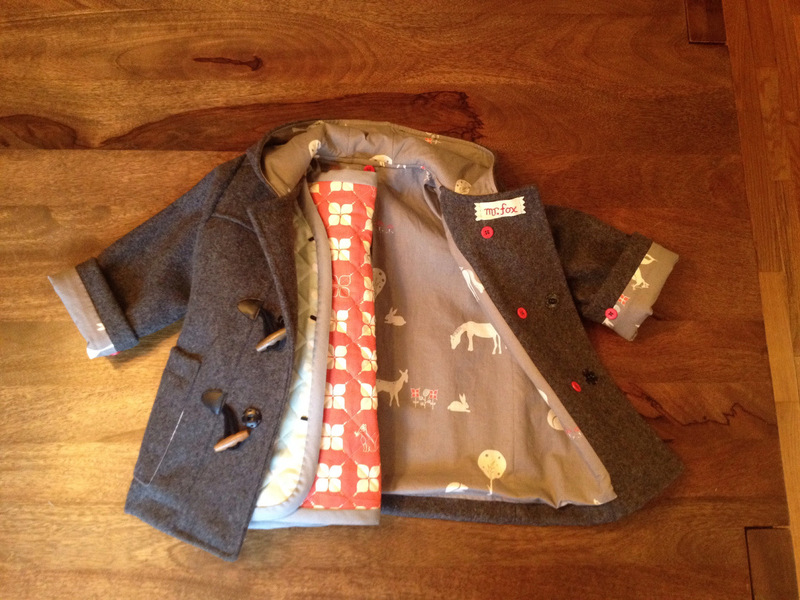 Drat – I’ve just last week finished making a School Days in grey wool for my one-year old son. I’d like to make it again for next winter so I’ll be following closely, especially the part about finishing the bottom edges as I couldn’t seem to get this right. I would really love to participate…but I too would like hints on fabric selection. 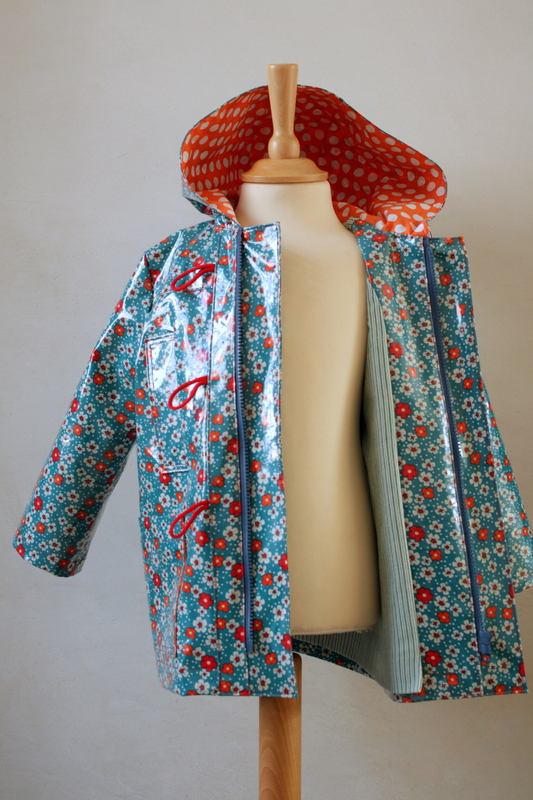 I have made raincoats…but would like to try and make one!! I bought all of the fabric to make twin versions of this three years ago but they never happened 🙁 I’ll definitely sign up so my littlest can have what her sisters missed out on! I have been waiting to sew this beautiful coat for some time now. What a wonderful excuse to get started! 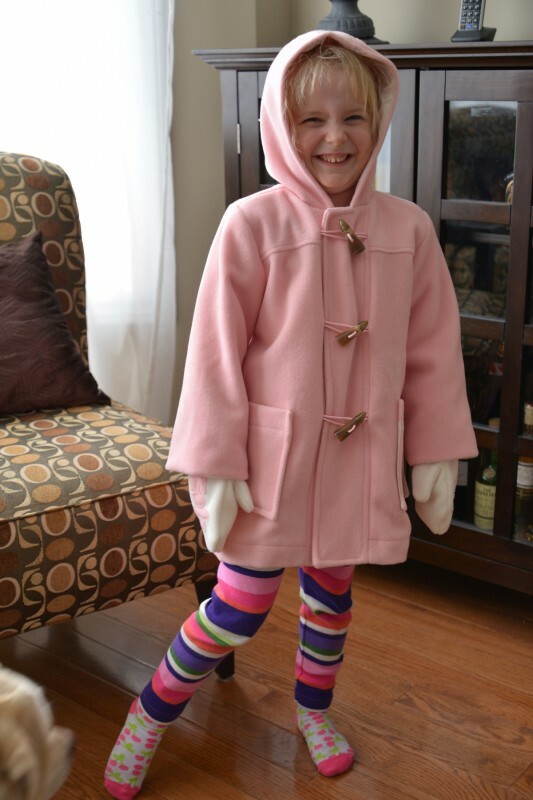 I’m planning to sew along, making coats for my 9 and 6 year old girls. I’ve drafted a larger size for my eldest. I too would love a tutorial on how to add a zip please, it would make the coats perfect! I am so pleased, I thought I had missed this! PS Deb has an inspired method for finishing the inside. I am in, and I would also love to see a zipper version. 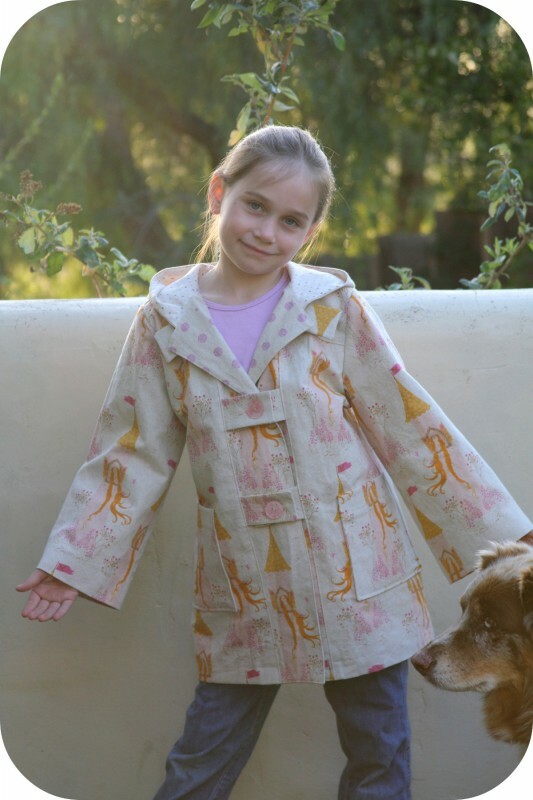 I am dying to try this pattern and my oldest daughter needs a coat. however I am having trouble finding wool coating that doesn’t cost an arm and a leg and is a suitable color (pink, purple, coral) for my daughters tastes. any advice? Zipper version, please!!! 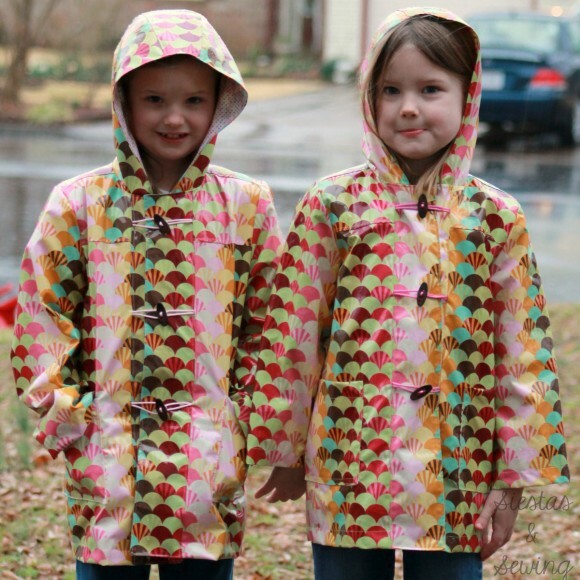 Also making raincoats and would love a zipper + velcro closure option- any chance the sew-along can incorporate this? Looking forward to it! I’m in! Made a 2T last year and it still fits my son. I had trouble with finishing the bottom and it’s coming undone. I’d like to make another one for my daughter in a 4T and this will give me the motivation I need. I have been poking around and noticed that several sites (this one included?) mention that the seams of the rain jacket will not be waterproof- anyone made this already as a rain jacket and had issues with leaking? I’ve made the rainjacket and didn’t have leaking problems. Just be sure to use a 100% polyester thread which will prevent moisture from wicking in. I’d also love a zipper option! I printed this pattern over a year ago but hadn’t made time to make it. Will definitely be following along. Wish my baby would allow me to sew in real time. I don’t know if zip insertion is going to be covered in the sewalong, as today’s post doesn’t cover a zip, but I’ve found a tutorial that Deb has added to her blog. I’ve just followed it for one the jackets I’m making and found it very helpful. There seems to be a BIG discrepancy between the measurements to use when choosing a size coat pattern and the finished coat measurements. Does this coat run very large? I see you posted this in the discussion forums too. The answer here is a good one: https://oliverands.com/community/forums/topic/jacket-questions-sizing-underlining/page/2/#post-58256. The big difference is indeed intention. 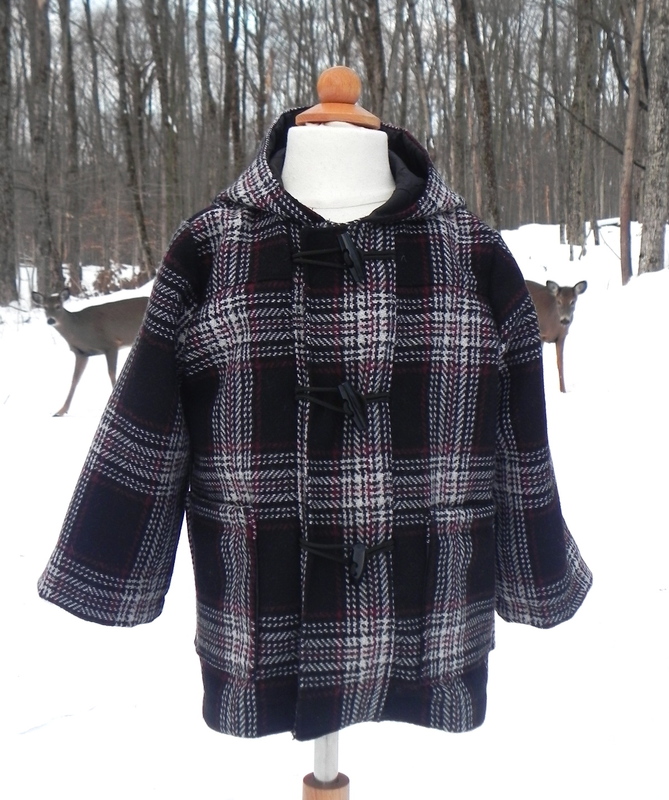 The coat needs to allow for clothing and the quilted lining worn under it. Use the size specified for the body measurements of the child, and you will be fine. Okay, I’ve purchased and printed the pattern pieces (8.5X11 paper) for the SCHOOL DAYS JACKET and OMG, my heart is racing at what appears to be the complexity in just piecing the pattern sections together. I’ve purchased electronic patterns, but, wow…this one worries me. Any tutorials out there for putting this pattern together? Suggestions? Peggy, no need to worry here. This is one of our most complicated patterns in terms of the number of pieces. So, of course, with more pieces the digital pattern will have more pages and more piecing together. All you need to remember to do is join the pieces together at the places where the circles with letters/numbers match. Go piece by piece, and everything will go together smoothly. Somehow I must have missed the “match the numbered/lettered circles” part. That’s what I get for looking at it in a tired state on a Friday evening. What threw me off was the “extra” space from one page to the next where the pattern lines did not exit. On that note, I noticed on some pattern pieces that the size 5 cutting lines were not completed. For example along the left/right edges of the front yolk piece. Am I to assume that I draw this in, connecting it to what looks like a corner mark (L)? I’m not sure exactly what you’re referring to here. Nothing should be missing, and you shouldn’t need to draw anything in. Just work through all the pieces, lining up the letter/number indicators and all the pattern pieces will be assembled perfectly.